Along with algae, plants are 'primary producers" and are the base of the wetland food chain. This is reason enough for plants to be recognized as important to wetland ecology. They are important in many physical and chemical processes in wetlands. They provide habitat and structure for many aquatic organisms. They help stabilize shorelines lessening the erosive force of waves. Plants have adapted to natural conditions present in wetlands and therefore are often ill-adapted to changes. These may include changes in nutrient levels, water clarity, and many other factors. 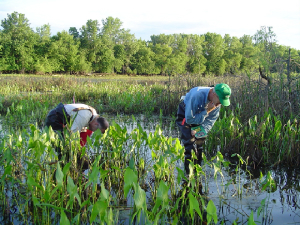 Plants are found in almost all wetlands and they are readily identifiable by people with a minimum of training. Plants are important indicators of water quality if only we learn to read their signals, and the IBI is the tool we use to help interpret the often complex changes occuring in wetlands. "But I'm not botanist! " Don't worry, most of the plants used as indicators in WHEP are easy to learn to identify. It just takes practice. The "Plant Identification Guide" found on this website provides a key to identification with pictures and illustrations.